Posted by Tantumblogo in awesomeness, Basics, catachesis, Domestic Church, error, family, General Catholic, priests, secularism, self-serving, sexual depravity, sickness, Society, SOD, the struggle for the Church. In anticipation of the re-opening of the Synod on the Family in October, an international symposium on the creation of Adam and Eve as the foundation of the Catholic doctrine on Holy Marriage will be held on September 26, 2015, at the Centro Congressi Cavour – Via Cavour 50/A (near Termini Station) in Rome. Experts in theology, philosophy, and natural science will demonstrate that the traditional doctrine of the Church on the divine creation of Adam and Eve harmonizes with the best arguments in theology and philosophy, as well as with sound natural science, including the latest findings in biology, genetics, and paleontology. The true origin of marriage, venerable brothers, is well known to all . . .We record what is to all known, and cannot be doubted by any, that God, on the sixth day of creation, having made man from the slime of the earth, and having breathed into his face the breath of life, gave him a companion, whom He miraculously took from the side of Adam when he was locked in sleep . . . And this union of man and woman . . . even from the beginning manifested chiefly two most excellent properties . . . namely, unity and perpetuity (emphasis added) (Pope Leo XIII, Arcanum, 5). According to Monsignor Barreiro, long-time director of Human Life International in Rome, “The international symposium will demonstrate the timeless wisdom of Pope Leo XIII’s teaching while exposing the serious errors in theology, philosophy and natural science that beset alternative explanations for the origins of the first human beings.” Participants in the symposium include Fr. Chad Ripperger, Ph.D., Philosophy (formerly professor of Dogmatic Theology at Our Lady of Guadalupe Seminary); D. Q. McInerny, Ph.D., Philosophy (professor of Philosophy at Our Lady of Guadalupe Seminary); Fr. Thomas Hickey, M.A., Theology (Faculty, Holy Apostles Seminary); Mr. John Wynne, (author, A Catholic Assessment of Evolution Theory); Dr. John Sanford, Ph.D., Plant Genetics (author, Genetic Entropy); Bai Macfarlane, (Director, Mary’s Advocates); and Fr. Francesco Giordano, STD (Director, Human Life International, Rome Office). I am told the conference will be live-streamed from the conference website. That’s very helpful, since arranging a trip to Rome on this short notice would likely prove beyond many reader’s means. Nonetheless, I think a symposium that focuses on the dogmatic reality of Creation, including Adam and Eve as our real parents, Original Sin, the falsity (or at least grave problems) of the evolution of species, and how all these matters tie in so centrally with the Church’s constant belief and practice regarding the Sacrament of Matrimony could not be more timely. In particular I think Bai Macfarlane’s work demonstrating how a liberal attitude towards annulment tends, in practice, towards abuse and even, in my mind, to become a sort of “regularized” form of Catholic divorce is most important to share on the eve of the Ordinary Synod on the Family. Many statements I’ve read from more progressive elements of the Synod seem to indicate that they think liberal annulment “regulations” is perhaps a means to escape what they view as the thorny knot of how to allow those with invalid second marriages to re-enter sacramental life. Of course, we Americans have long experience with this and know there is great potential for abuse, scandal, and grave harm to souls in these kinds of arrangements. Hopefully Chad Arneson, who apprised me of this symposium, can apprise us of the live-streaming arrangements. He did, you can live-stream on the conference website the day of the event. I pray this conference is very successful at influencing the Synod fathers to a greater understanding of the errors of so many “modern” arguments regarding marriage and the truthfulness of the Church’s sacred Doctrine. Posted by Tantumblogo in Admin, awesomeness, Flightline Friday, foolishness, fun, non squitur, silliness, Society, technology. See how squeaky wheels get the grease! You just keep it up, Woody. I’ll have you so tired of Flightline Friday you’ll be begging for some endless SSPX fights. Actually, when I watched this on my phone last night with a tiny screen it looked a lot more dramatic than it did in high def on a large monitor. It looked a bit lame. I was reminded of WWI biplanes with a rear gunner on a flexible mount. Pretty much the same speed range as WWI fighters, too (slow). Shooting down a maneuvering target with a pintle-mounted gun being next to impossible (all those WWII movies you’ve seen of B-17 waist gunners shooting down Me109s or FW190s……..rarely, if ever, happened. Pintle mounted guns are not known for their terrific accuracy, especially against swiftly moving targets. So it was actually a pretty good bit of marksmanship to shoot down that small drone conveniently flying directly abreast the helo at the same speed and maybe 100 yds away. Here’s Blaine’s bird doing what it does a lot of the time, if the military coverage is any indicator. It may not be glamorous but hauling stuff from one ship to another is a pretty mean feat in itself. It ain’t easy to hover above a moving, bobbing ship, picking up loads, setting them down right where needed, without hurting anyone or crashing the bird. Then there’s the fun of load shifts, wind, and all that. So good job! Not sure where the Puma’s from. It’s got a US civil registry, so maybe contractor? I didn’t know there were (m)any SA-330s flying in the US? This guy’s got a lot of MH-60S footage. I wonder if our reader knows him? HSC-25 and HSC-14, apparently. Posted by Tantumblogo in Admin. Actually, if you want to go pray outside the strip joint, please, go ahead. I cannot go, and most other regulars have a conflict. But at some point I hope this effort starts to take a life of its own where I’m a coordinator at most. I’d love to see other men offer to lead and pray outside on nights that are convenient for them. I won’t be there tonight, however. Next vigil I plan on doing is next Wednesday 090915 @ 8pm. Posted by Tantumblogo in Basics, catachesis, different religion, disaster, error, foolishness, General Catholic, horror, scandals, secularism, self-serving, sickness, Society, Spiritual Warfare, the struggle for the Church. And one that is inveterately hostile towards Christianity. Leftism – or the Revolution – came into being specifically as an attack against Christianity. It is a manifestation of man’s pride, envy, and sensuality. Leftism doesn’t care about other religions, and will likely mutate into a form that would gladly accept seemingly incompatible religions like islam, because the Revolution is a reaction against, and a form of distilled hatred towards, the Church. I’m reading a quite good book on the subject now, Revolution and Counter-revolution by Plinio Correa de Oliveira. Yes there are more moderate forms of leftism, but as we see around so much of the world today, even after the ostensible fall of communism, in reality, leftism is advancing on many fronts, especially in this country. In fact, it is when it appears to be held in check or in “remission” that leftism/the Revolution often makes enormous gains through insidious penetration of men’s minds. Think on the experience of the Church – it appeared Pius X crushed modernism (a religious manifestation of leftism) so that attention towards this heresy foolishly lapsed, but decades later it re-emerged far more powerful and energetic than before, because so many of its tenets had, through some process of silent infiltration, been absorbed into the minds of so many souls. Communism was not the crazy fantasy of a few fanatics, not the result of human stupidity and baseness; it was very real, very real part of the history of the twentieth century, and we cannot understand this history of ours without understanding communism. We cannot get rid of this specter by saying it was just human stupidity. The specter is stronger than the spells we cast on it. It might come back to life……. At present Marxism neither interprets the world nor changes it: it is merely a repertoire of slogans serving to organize various interests, most of them completely remote from those which Marxism originally identified itself. If you think I exaggerate, an increasing number of pseudo-scholarly popular books have advocated giving communism just one more try in recent years. It’s always one more try, we just needed a bit more time, they didn’t do it right, we’re way better informed than they are. Leftism is a system of pride, envy, and hatred, envy of anyone who might have more (especially the benighted hoi polloi lacking a background at Andover and Brown), or be happier, and hatred of that one indestructible source of happiness and truth, God. I know this is largely speaking to the choir, but even so many Catholics – even the institutional Church into this country – accept a great deal of revolutionary thought. They’ve never known any different. Much of the time they have no idea it is revolutionary. And yet their revolutionary beliefs are the most corrosive acid eating away at the Church today. To turn things around, we’re going to have to start calling people on it, and trying to start to educating them in the vast gulf that exists between the culture (and Church) of today, and that which existed 200, 400, 600 years ago. Not an easy row to hoe, I get it, but sometimes even pointing out little errors here or there can start someone down the path towards understanding that maybe, just maybe, enlightenment liberal republican government isn’t the best form of government for the good of souls and society at large. Posted by Tantumblogo in awesomeness, Basics, episcopate, General Catholic, Glory, Grace, Interior Life, manhood, religious, Sacraments, sanctity, Tradition, true leadership, Virtue. Saint Alphonsus Maria de Liguori ruminates on the failure of so many Christians to comprehend the depth of God’s love for them, even to the point of becoming a stinking, hairy man made of dirt, and subsequently dying quite probably the most tortuous death ever suffered. Why are we so ungrateful? The great Moral Doctor lays it out for us. We can in fact come best to appreciate Christ’s Sacrifice by meditating on it frequently. How is it, then, that so many Christians, although they know by faith that Jesus Christ died for love of them, instead of devoting themselves wholly to love and serve Him, devote themselves to offend and despise Him for the sake of brief and miserable pleasures? Whence comes this ingratitude? It comes from their forgetfulness of the Passion and death of Jesus Christ. And, O my God, what will be their remorse and shame at the Day of Judgment, when the Lord shall reproach them with all that He has done and suffered for them? Let us not, then, cease, O devout souls, ever to keep before our eyes Jesus crucified, and dying in the midst of torments and insults through love of us. From the Passion of Jesus Christ all the Saints have drawn those flames of love which made them forget all the good things of this world, and even their own selves, to give themselves up wholly to love and please this Divine Savior, Who so loved men that it seems as if He could not have done more in order to be loved by them. In a word, the Cross, that is, the Passion of Jesus Christ, is that which will gain for us the victory over all our passions and all the temptations that hell will hold out to us, in order to separate us from God. The Cross is the road and ladder by which we mount to Heaven. Happy he who embraces it during his life, and does not put it off till the hour of death. He that dies embracing the Cross has a sure pledge of eternal life, which is promised to all those who follow Jesus Christ with their cross. O my crucified Jesus! To make Thyself loved by men, Thou has spared nothing;; Thou hast even given Thy life with a most painful death; how, then can men who love their kindred, their friends, and even animals from whom they receive any token of affection be so ungrateful to Thee as to despise Thy Grace and Thy love, for the sake of miserable and vain delights! Oh, miserable that I am, I am one of those ungrateful beings who, for things of no worth, have renounced Thy friendship, and have turned my back upon Thee. I have deserved that Thou shouldst drive me from Thy Face, as I have often banished Thee from my heart. But I know that Thou dost not cease to ask my heart of me; Thou shalt love the Lord Thy God (Dt vi:5). Yea, O my Jesus, as Thou desirest that I should love Thee and offerest me pardon, I renounce all creatures, and henceforth I desire to love Thee alone, my Creator and my Redeemer. Thou dost deserve to be the only object of my soul’s love. O Mary, Mother of God, and refuge of sinners, pray for me; for me the Grace of loving God, and I ask for nothing more. I was really struck with that bit about animals. I see married couples with stickers on their cars who say “We have children with four legs” in the shape of a dog’s paw. Perhaps a few simply could not have children by accident but given how many today are proudly childless by choice and in fact view children as “life ruining” I imagine there’s quite a bit of crossover between the two. But I’m just as guilty of putting my love for vain pleasures ahead of my love for Jesus Christ. I hope and pray I’m better at it today than I was 5 years ago but I know I still fail to live my life in accord with God’s Will on an all too frequent basis. One of the many glories of our religion, however, is the fact that we have Confession and sacramental Grace to make us whole after we fail. Far too many today, however, simply do not choose to avail themselves of that Grace, or hold themselves above it. That’s the biggest tragedy of all, and will be a point of bitter remembrance for many souls, I fear, at their particular judgment, knowing how easy forgiveness to obtain and yet still failing to do so. Lord, may I never be so foolish. 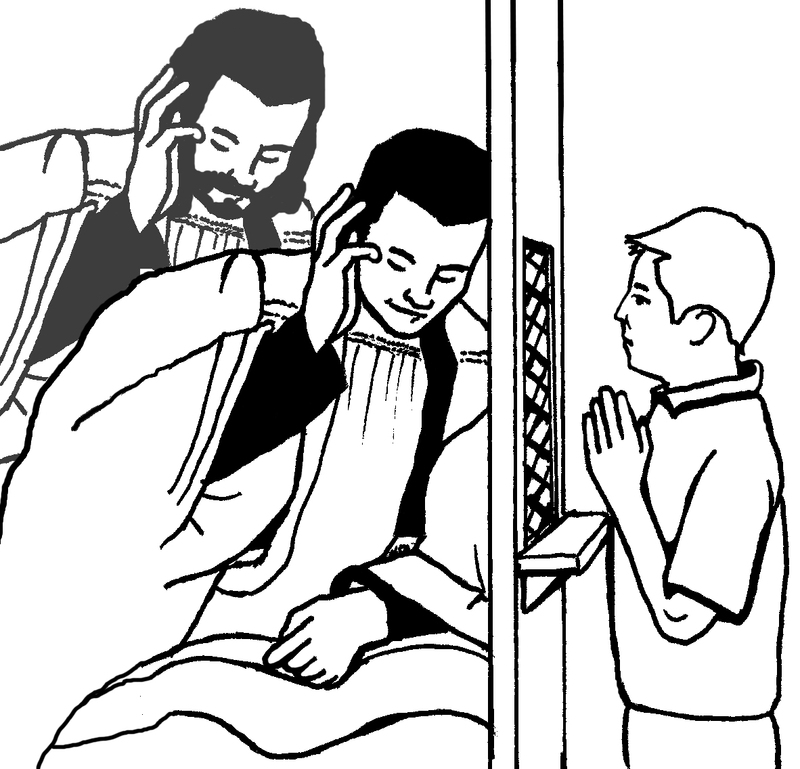 When I fail, which is far too much, may I ever turn to Your mercy in the Sacrament of Confession, and always have true contrition for my sins and the firmest possible purpose of amendment. Posted by Tantumblogo in disconcerting, General Catholic, Interior Life, manhood, pr stunts, priests, sadness, scandals, shocking, Society. I won’t go into the particulars about what transpired in the past – it’s water under the bridge – and I’m sure there’s information on the Internet (some of it more reliable than other information, obviously) for those who may not be familiar with the situation. Plus, those who really didn’t pay attention to him in the first place likely don’t care one way or the other about his current status. The bottom line is that we all are wounded and spiritually/morally fall often (I know I do!). We just have to try our best to keep moving forward in faith in this “valley of tears.” A very difficult task, I must say. That doesn’t mean condoning moral corruption or remaining silent about it, but we all need God’s mercy. Well that’s certainly charitable but it also seems a bit of a whitewash. The wheels came flying off spectacularly from late 2010 till the final shutdown of “Black Sheepdog” in 2012. It’s a bit odd seeing a Renew America author try to sort of just spin that very visible fall away when some of the harshest coverage of Corapi came from…….Renew America. I’m sure it’s being done for a good reason. Personally, if Corapi is in some kind of ministry or living his priestly life again, I pray it remains very quiet and very far from the limelight. It might be consoling for souls, after he is well-established (again?) in his piety and interior life to send out a brief note to souls to tamp down potential speculation – assuming this report is true. I’ve seen what a firestorm Corapi speculation can ignite. If there are going to be hints of his rehabilitation – we know not whether this little tidbit comes with his knowledge and approval, or not – would it perhaps be prudent for he and/or his superiors to let his status be known and that he won’t be renewing public ministry (which probably isn’t even a possibility, given the cloud of accusations under which he left the priesthood in the first place). As for me, I’ve really moved on. Fr. Corapi played a substantial role in helping me understand a relatively orthodox view of the Faith during the early part of my conversion, and his stories played a small part in inspiring me to bend my will to the Faith and change my life (Grace was the dominant part, of course, among many other factors). But even before his “implosion” I was already feeling like I had grown past his spiel, for the most part. I think he served a great role in edifying and consoling souls at a certain place in their spiritual life. There are other priests out there who – I believe, and pray – have helped advance my, and many other’s, spirituality to another level. Nevertheless, as said above, I think, no matter what, that kind of public role is all in the past. I’d be very surprised to see him in public ministry again, and it would raise a flock of questions.